Event Track / Coachella / Planning Guides / Are Coachella VIP Passes Worth It? Update: I have updated this article based on our experiences at Coachella 2017. I know I never like to wonder if the information in an article is relevant: I have updated this article to reflect the most recent Coachella VIP experience. In general the Coachella VIP experience continues to improve, but ultimately not justify the cost in my opinion. Read on for all the pros and cons of Coachella VIP. The biggest pros of VIP passes are the private viewing areas and the VIP line that gets you right into Coachella. So you have decided to go to Coachella (great choice) and are now deciding between the regular general admission passes and the VIP passes. This is a classic Coachella question that a lot of people talk about. This article will go into all of the differences between the general admission passes and the VIP passes for Coachella. Of course a lot of this will come down to you, your personal feelings and how much of a baller you are. So I present to you my opinion on VIP passes based on having gone to Coachella the last three years and discussing it with other people. What is the price difference between Coachella GA and VIP passes? The general admission passes for Coachella will run you $429. The VIP passes for Coachella are priced at $999. If you buy passes during the Coachella presale in June you can take advantage of the payment plan for either pass. This would divide each pass into 6 payments, so this is one way to make the the Coachella VIP passes more affordable. Do both passes sell out? They do, but the VIP tickets do sell out a lot slower than the general admission tickets. If you want VIP tickets you should have no problem during either the Coachella presale or the general sale getting them. You could miss out on the general admission passes because those will sell out within an hour or two of Coachella passes going on sale. VIP passes will be available for several hours, and in some years for Weekend 2 VIP passes will last weeks beyond the initial sale. That said, I never say to wait to purchase Coachella passes: get on there as soon as they go on sale and secure your Coachella passes ASAP. What do I get with general admission Coachella passes? You get to go to the festival; that’s about it. Don’t get me wrong, Coachella is awesome but all GA passes do is let you into Coachella, there are no added perks. You get access to everything not in a VIP area within Coachella so that's all the stages, most of the food, most of the bathroom areas, etc. What do I get with a VIP Coachella pass? You get to scoff at all the peasants with their basic wristbands which are a different color than your wristband. OK not really but you do get some perks. VIP Areas – there are two VIP areas. One is located adjacent to the main stage under the white tents. The second VIP area is located directly next to the Sahara tent in the Rose Garden. These passes do not give you access to those special areas right by the stages. Those are for press passes and artists passes: these are NOT for VIP Coachella passes. I just wanted to point this out explicitly as every year I hear from people who have purchase Coachella VIP passes and are upset they didn't realize this. The ONLY special viewing areas for VIP are left of the mainstage and near the Sahara tent. Are these perks worth it? Let’s take a look at each of these perks one by one. The main one is the private VIP areas, with one being by the mainstage and one being by Sahara. The first VIP area is located at white tents to the left of the Coachella Stage in the map above. This is the VIP area near the main stage. This area provides shade, lots of seating, air-conditioned tents and full bars. This is really nice during the day when it’s 100 degrees outside. It’s also nice to just have an area that is private and you have some breathing room. Once it gets to about 6 or 7 p.m. the crowds in Coachella become huge. The VIP area gives you an area that is less crowded and a little more room to breathe. A picture of this VIP area by the Coachella Stage can be seen below. You can see there is plenty of room and seating for everyone to sit around and not look like they are at a music festival. 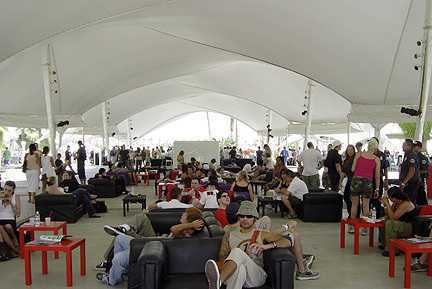 The other VIP area is by Sahara tent and provides you with an equally private area to view the acts at Sahara. If you haven’t been to Coachella before you should note that the Sahara tent is the EDM area. So if you love EDM this could be a big plus for you, but if you don’t like EDM this area is essentially useless to you in my opinion. It's a little annoying that because Sahara is a tent you don't get a great view here either of what's going on at the Sahara stage. Overall I would say the view at the Coachella Main Stage are better than the one near the Sahara tent, but neither are fantastic. In years before 2017 I would say the VIP bathrooms are great not only because they are flushable, but because there will be no line. In years past the line for the bathrooms in the general admission areas have been awful. However, with the massive Coachella expansion in 2017 they added more bathrooms and I found the lines to be much shorter in the general admission areas. It's still nice to have the VIP bathrooms, but I would say them having no line is no longer a big advantage like it was in years past. Note my fiancée thought the same thing, so this is applicable for both males and females. Do keep in mind that the bathrooms for general admission are primarily portapotties sitting out there in 100 degree heat. Use your imagination on how lovely this can be on a hot Coachella day. I basically adopt a hold your breath strategy and get in and out as fast as humanly possible. VIP patrons don’t have to worry about the lines or the grossness as they have actual bathrooms that are private. It's definitely a nice perk for the Coachella VIP. Another way Coachella has recently been trying to differentiate their VIP passes are by putting exclusive food vendors in the VIP area. Typically Coachella brings in some of the best food from Los Angeles and San Francisco to treat festivalgoers to many delectable treats. Lately more and more of the really famous places have been going in the VIP. There are still plenty of options (more than you can try in a single or even two Coachella weekends) so it's not a huge deal, but you could be more tempted for the VIP if you are a big foodie. I personally always find great, new stuff in the GA each year, but I wanted to make a note of this. I expect this to continue in the future as Coachella in 2017 made more of an effort than in years past to do this. The last major benefit is the private entrance into the festival. This could be a big benefit to you, or pretty irrelevant all depending on the time you plan to arrive at the festival each day. I personally always have a band I want to see at 1 p.m. or earlier so I head to Coachella fairly early, much to the chagrin of my fiancée. If you are getting to Coachella at this time you can usually get in really quickly with a very small line. In general we walk right into Coachella, maybe a 5 minute wait tops as they check bags. The days I have gotten to Coachella later, at 3 to 4 p.m. the line can be quite significant. I would estimate we have waited up to 45 minutes to get through security and into Coachella. I'd also like to add that this is pretty unpleasant: you are in a line full of people, standing and waiting to get into Coachella in the 90-100 degree heat. It's pretty easy to get irritable in this situation and gets some bad vibes going into Coachella. The line is particularly long for the ladies usually as their purses are all subject to search. If you have the VIP pass you have a separate entrance into Coachella. This line never gets backed up regardless of the time you show up. So if you think you are going to get into Coachella later this is a nice benefit. Plus, you do feel like a boss going through a private entrance while everyone else waits in a long line. For me, it is not worth it. I've been to nearly 20 different music festivals and Coachella's VIP offerings is one of the worst. Again, this is a personal choice but I don’t think the benefits of the Coachella VIP pass are worth $579 extra unless money is just not an issue for you. The biggest benefit of the VIP Coachella passes are the private bathrooms, and I just can’t justify paying $579 for bathrooms. I don’t care for EDM personally so the VIP area by Sahara does nothing for me – obviously if EDM is your thing then the VIP is a lot stronger of an option. Even this special area though doesn't give you a very good view of Sahara, you will be outside the tent to the side. Also, I prefer to be in the crowd closer to the stage for the shows. The VIP area by the mainstage is pretty far, and while you can watch it on the giant screens and hear the music clear as day, for me there is something lost not being in the Coachella crowd near the stage. The picture below shows the view of the main stage at Coachella from the VIP area. As you can see it is not exactly a front row seat and it is really far off to the side. It’s great the VIP area is by the Coachella stage where the biggest acts play, but I wish it was closer given the passes are nearly three times as expensive. I am very jealous of the shade and air conditioned tents during the day; this is an awesome feature of the VIP passes. Coachella can get unbearably hot and an area to cool down would be delightful. But is some A/C, shade and nice bathrooms worth $579 more? Again this is personal opinion, but I don’t see the VIP passes for Coachella being worth it. The only VIP areas are at the Coachella Main Stage and Sahara tent, and neither of these are a great view of either stage. The weekend is already expensive between the passes, food, booze and accommodations. Skipping out on the VIP passes is an easy way for me to save $579 a person so I vote for general admission passes. Either way you will enjoy Coachella so just pick what you think is best for you. Hopefully this article has helped clear up the differences between the VIP and GA Coachella passes.